Not dry here, though. In its lower reaches, the water drops into sinks and travels below ground. Thus, the name Dry Fork. The stream would be easily fordable on horseback in August, but it might be a "biting dog," as they say, in spring runoff. The Forest Service kindly built a bridge to make crossing easy any time of year. We saw a number of beautiful lakes and ponds, and rode through scenic open meadows. One of our friends' horses decided to put on a bucking display while going through a bog. Fortunately, the rider kept his seat, and all was well. Here's Steve in Lightning Park. The place is aptly named, to judge by the tree on which the sign is nailed. The tree is dead and looks as if it were the victim of heaven-sent electricity. Our last stop was in Blanchett Park, through which a docile Dry Fork meanders. Over 2 days, we covered close to 25 miles. One of the guys is an expert at Dutch Oven cooking - if he'd been the cook on one of the 1880's cattle drives, the cowboys would have refused to go home. We neglected to take a photo of the feast, probably because we were too busy stuffing ourselves. We ate like royalty. Too much more of that, and I'd have to be hoisted onto Mischief with a crane! To see more worlds from all over our globe, click here. Daisy always starts out as fresh as... well, a daisy. After a few rolls in the dust, she's looking a little less fresh. Until, by the end of a day, even our wild Daisy is tame enough to enjoy a rest. 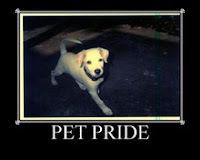 For more proud pets, click here. Birds flit everywhere at 11,500 feet, on the slope of Leidy Peak. Perhaps they're enjoying the last days of summer. Steve managed to catch a few of them sitting still. Above is a White-Crowned Sparrow, identified by Sweetbay. Thanks for the help! but even a half-blind birder could name the bright and lovely male Mountain Bluebird! And the birth of a late summer moon. For a myriad of skies from all over the world, click here. On a recent ride in the terrain north of Strawberry Reservoir, we traveled along the creeks and saw numerous active beaver dams and lodges. The one above, located on the little west fork of the Duchesne, has a main hut, and a cozy mother-in-law dwelling beside it. On Willow Creek, we saw evidence of a series of abandoned dams. The beaver cut down aspen or willow for food and building material, creating a clearing. The dams they build form ponds that spread out and slow the runoff of spring snowmelt, allowing the water to soak in and drop its silt, sculpting verdant meadows. and case caddis fly nymphs clinging to the wet stones. These bugs are important in a trout's diet, so anglers take note. Along the stream, we found monkshood in bloom (above), so named because the lower petals appear to be covered by a hood. In a nearby meadow, we saw this unknown flower. Every outing needs at least one mystery upon which to ponder. For a challenge, Steve tried fishing from Boss's back, very carefully. Boss was fearful of the fly rod at first, thinking it was a fiery fiend, but he soon finished fidgeting around the field and faced the stream, figuring there was no point in fighting his fickle fellow. Steve went back to finding fulfillment through fish, but with Daisy and Boss's assistance. With two sharp-eyed friends on the lookout, how could Steve fail to find trout aplenty? A final word: I, Janie, was there, firsthand, fotographing the fishing. Never fear, this is all factual, or at least not as fictitious as the usual fish fable. Hunting season has begun (only bow hunting so far), making the wildlife wary. All of us, including Daisy, donned hunter orange for our ride north of Strawberry Reservoir last week. Cows still graze in the high country, but the ranchers that hold the grazing permit will move their stock to lower altitudes soon. and the glory of the high Uintas to the northeast. We'll try to visit again in September, when the elk bulls bugle their mating call and aspen turn gold. "After a long day climbing a mountain, my back itches," says Daisy. "Time for a refreshing wiggle down the hill. You guys should try it!"